MIG welding has four ways of transferring the wire to the joint. Short circuit transfer is a transfer used when a lower voltage is used for MIG welding. Short circuit transfer occurs when the wire contacts the metal creating short circuits. During this short circuit the wire contacting the metal heats up and melts into the joint by creating a puddle from contact. Then another contact begins and the process keeps repeating many times a second. The easiest way to tell if the transfer is short circuit is by the sound. The sound greatly resembles an egg hitting an extremely hot frying pan or high pitch crackle. It is a very crisp and fast crackling sound. Typically short circuit transfer is used on thin metals or sheet metals. Short circuit transfer typically uses either CO2 shielding gas or most mixtures that contain less than 75% Argon. In short circuit transfer CO2 gas has a deep penetrating property that works well on thinner metals. That’s why most automotive body shops use short circuit with CO2 gas. Too much Argon gas in the gas mix is going to want to spray and have fluid characteristics thats not wanted. In order to set up short circuit transfer you want to be welding materials with a high CO2 content gas and it needs to be thinner materials such as 1/8 or thinner. If you are getting a fast high pitch crackling sound then you are welding with a short circuit transfer. If the crackle is slow then increase the wire feed speed till it sounds right. Short circuit transfer is very easy to weld with and works great in all positions. This does change on thicker materials and that’s covered below in th spray transfer section. Globular transfer is similar to short circuit transfer. Globular transfer occurs when the wire arcs and it creates a glob that hangs off of the wire. Then the glob falls to the metal filling the joint and then the process begins again. Globular transfer has a slow popping sound to it. It has a few pops per second and many times you can actually see the glob being formed and dropped. Globular transfer is typically done with a C25 (25% CO2 and 75% Argon) or or greater percentage of Argon shielding gas. The Argon gas may contain a percentage of Carbon Dioxide, Helium, and or Oxygen. In many cases the same gas can be used for spray transfer. One downside about globular is spatter on the nozzle. 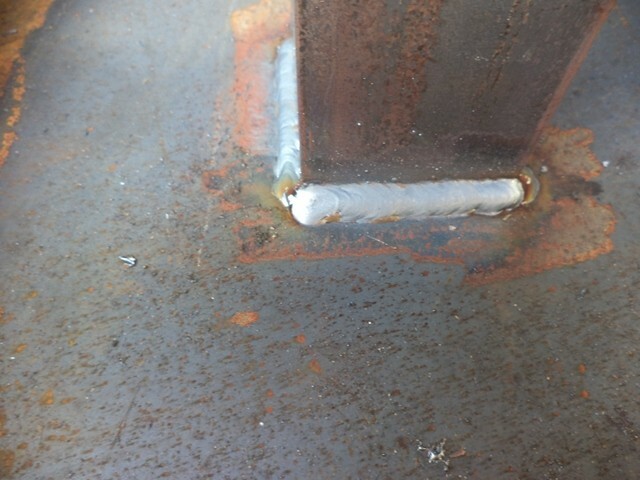 Below is a stainless steel weld I did using a globular transfer with C2 gas (2% CO2 and 98% Argon.). 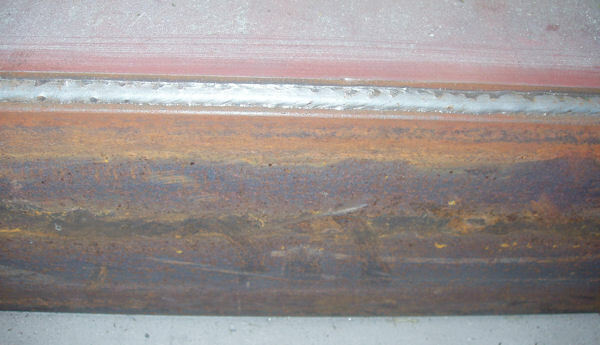 Stainless steel MIG weld done using globular transfer process with C2 gas. To set up globular transfer you want to get your weld started with a crackling sound. Once you have the machine set up and penetration of the weld is good then lower your wire speed feed until the weld starts having a slow popping sound. Be careful not so slow your wire feed speed too much because you will blow you contact tip. Spray Transfer is a transfer where a higher voltage is applied and the electrode does not contact the metal. The transfer is exactly like it sounds. The wire sprays or has very fine mist transferring to the metal. You can also see a clean arc to the metal and will not have any spatter. Spray transfer can also be defined by a minimum amperage setting by welding engineers for thicker metals. There are two types of spray transfer. True spray transfer has a hissing sound to it and has no spatter and a very fluid like arc kind of like a candle flame. It wonders a little and is just a quiet blue arc about 1/4 long. This transfer type is only used in the flat and horizontal positions. Spray transfer works great on steel, stainless and aluminum where clean welds are needed. The second spray transfer type has a crackling sound to it and is defined by a minimum voltage and amperage setting. The electrode never contacts the metal and there is a arc between the metal and electrode. What creates the crackling sound is the wire speed feed is so fast the the puddle has has violent reactions from the fast deposit rate. 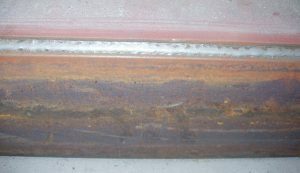 Below is a picture of a spray transfer weld I did that had a deep fast crackling sound. The base material is 12 in channel welded to 1/2 inch plate in a single pass. The voltage I used was 36 to 38 volts (large industrial power supply) and around 350 inches per minuite wire feed speed with a .035 E70S-6 electrode. The heat was so hot my leather gloves curled and pausing for a second would blow a hole in that material. For true spray transfer the shielding gas should be either pure Argon or a mix of Argon, Carbon Dioxide, Helium, and or Oxygen. Carbon steel uses any mixture with 75% or greater Argon will do. Stainless steel needs a C2 gas or 98% Argon and 2% CO2 or tri mixes are another option such as 90% Argon, 2% to 10% Carbon Dioxide and up to 5% Oxygen. 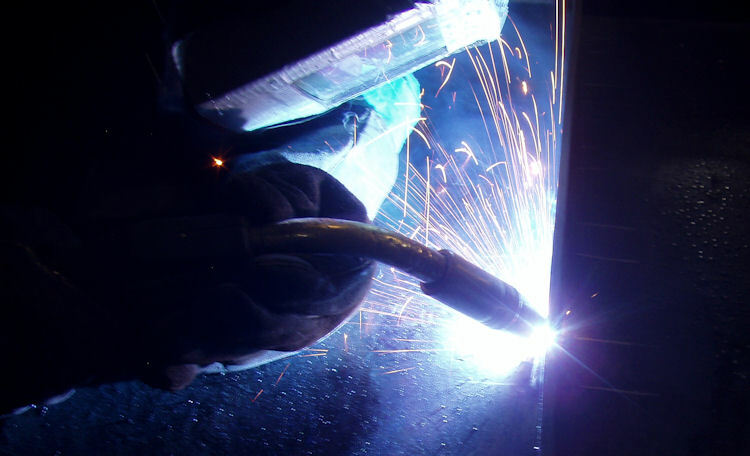 Aluminum welds as normal with either 100% Argon or Helium or any mix of both for heavier materials. Setting up the welder for true spray transfer is done by setting up you machine to penetrate properly and then either increasing the voltage to get a fluid arc or cutting back on the wire feed speed till the arc is the desired length. Spray transfer on thicker materials is defined by minimum voltage and wire feed settings. 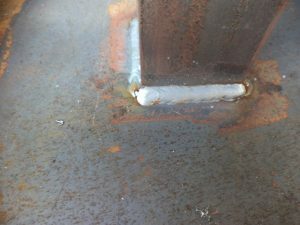 In most cases you can either see there is a arc and no direct contact of the electrode to the joint or a welding engineer has specified the settings.